PT. Jakarta Propertindo (Jakpro) repairs road and road median affected by Light Rail Transit (LRT) construction.
" Repair is only done in area that affected by LRT Jakarta project"
Repaired roads are Jl. Boulevard Raya, Jl. Raya Kelapa Nias, and Jl. Kayu Putih Raya. LRT Jakarta Project Director, Iwan Takwin mentioned, his side repairs road along LRT phase 1 route as long as 5.8 kilometers. Moreover, his side also repairs road median such as park and pedestrian. 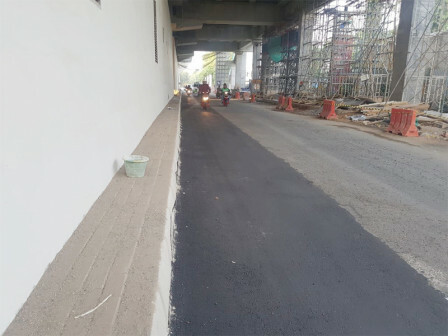 "Road repair especially for road that connects several Asian Games venues, such as velodrome and equestrian, is done from last week," he informed, Wednesday (8/8). In order to repair the road, his side uses hot mix asphalt. While for park, his side is replanting the crops and for sidewalk his side repairs it in accordance to Bina Marga Dept. 's standardization which is using con-block paving. "We repair the road at night, while repair road median in afternoon," he added. PT. Jakpro's Business Development Director, Hendra Lesmana explained, road repair is done gradually and targeted to finish before Asian Games. "Repair is only done in area that affected by LRT Jakarta project," he conveyed.